I toggled HDR in the Win 10 display options. Unsure if it is madVR or my TV, but I have had to reset my TV settings to get the HDR to toggle back on. Even did a full 8.1 install then 10 again. Was not till I reset the TV that it worked again, no idea if its a driver issue or the TV, just so many variables it is hard to pinpoint, especially when it can work one day and then you have to mess with madVR another day for some reason. At least if the TV is back at default you can work backwards, bloody annoying as I wish I had done that first. Again, Regular madvr AMD HDR playback works fine. Last edited by tp4tissue; 15th January 2019 at 16:12. Does your player render through OS-HDR or AMDHDR or NV HDR. I'm on MPCHC, so it renders through AMD HDR. All good on the desktop side with MPC-HC and MPC-BE, I use NV HDR and its all good, just recently started in KODI no ideas why, but its better than your scenario as at least it works for the most part. Does it go into HDR in a windowed mode? In the past, on Nvidia, I was able to use a video playing in MPC-HC to trigger HDR as a workaround for madTPG not triggering HDR. 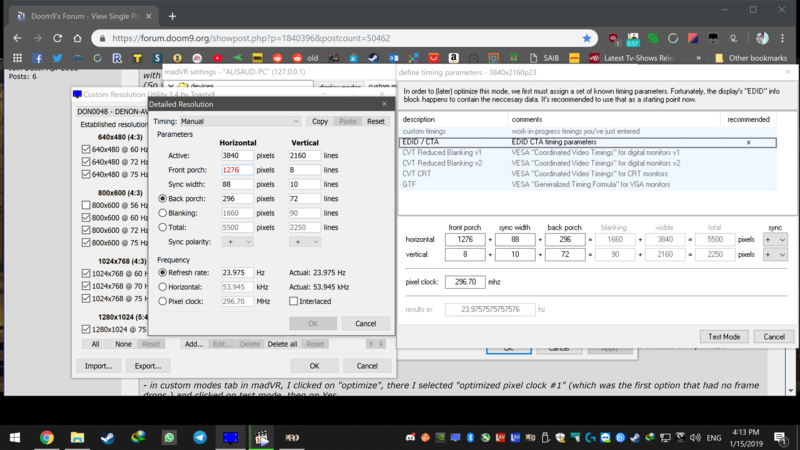 On my ATI card, it will only HDR on fullscreen for playback, madtpg doesn't HDR at all. My nvidia works fine, hdr triggers on windowed , but unnecessary because the madtpg will trigger nv hdr as well. I can select 12 bit in NVCP panel in 1809 but obviously cant get it to stick in a custom res in the NVCP. Yeah, same, I really hope madshi still looks at these forums and maybe next madVR version will have custom display mode with color bit depth settings. There probably is a difference, but you can't perceive it on that display. What setting are you referring to? Yeah if you check the OSD, you can see if things are changing and what they're changing to. If you can't see differences then it's down to your display/viewing distance. I would hope you know what to look for but in case you don't, luma scalers and sharpeners make the most difference when looking at SDR content. At 2 meters luma scaler might not even be that obvious if the material resolution is high..
Chroma is very difficult to discern at distance. If one's adamant about seeing what's happening, you can Zoom-in and the difference will be very obvious. Last edited by tp4tissue; 16th January 2019 at 03:27. I don't get it. Why don't you manually activate HDR in Win 10 display options, just for the need of calibrating ? When it is done, you can always go back to normal behavior of triggering HDR With regular madvr playback. Please quote the error as text (often you can press Ctrl+C in a dialog), or upload the picture to an external image hoster (frupic, tinypic, imgur, ...). Approval of attachments by a moderator often takes a long time here. The calibration results probably wouldn't be accurate because it's a different render path ? I'm not sure, but that's how I assume it works. Last edited by Warner306; 16th January 2019 at 14:14.